Palestinian state rises while the belief that armed struggle is the most effective means drops. But distrust in the seriousness of the Trump Administration increases. Similarly, findings show a significant rise in the belief that the Trump plan will not include a Palestinian state, nor will it include a reference to East Jerusalem as a capital for the state, or an emphasis on the 1967 borders, or a call to a just solution to the refugee problem, or a call to end the Israeli occupation and the withdrawal of the Israeli army. Given all these doubts about the plan, about 80% demand that the PA leadership reject the American plan when made public. Only 43% of the public expect elections, parliamentary or parliamentary and presidential, to take place in the Palestinian territories in the near future; 46% believe no elections will take place. An overwhelming majority (72%) wants elections to be for both, a parliament and a president, while only 10% want parliamentary elections only. 13% do not want any elections. The belief that presidential and parliamentary elections will take place soon is stronger among those whose age is 50 years or higher (44%) compared to those whose age is between 18 and 22 years (39%), among women (45%) compared to men (41%), among residents of villages/towns (46%) compared to residents of refugee camps (41%), among those who ended elementary school only (56%) compared to those who finished their BA (37%), among those who work in the public sector (46%) compared to those who work in the private sector (41%), among the married (45%) compared to the unmarried (39%), among the religious (47%) compared to the somewhat religious and the non-religious (42% and 29% respectively), among supporters of the peace process (49%) compared to those who are opposed to the peace process (35%), and among supporters of Fatah (55%) compared to supporters of Hamas and third parties (44% and 36% respectively). An overwhelming majority (72%) expects Israel to refuse to allow election to take place in East Jerusalem and 15% expect Israel to allow it. Similarly, 53% believe that Hamas will not allow election to take place in the Gaza Strip if such vote was restricted to parliamentary elections and 33% believe it will allow such election. If elections were for a parliament and a president, 66% want Hamas to participate and to allow them in the Gaza Strip while 26% say they do not want Hamas to participate or allow elections in the Gaza Strip. But if elections were for a parliament only, 59% say they want Hamas to participate and to allow them in the Gaza Strip while 32% would oppose that. About three quarters (74%) oppose and 19% support the holding of parliamentary elections only and only in the West Bank. Similarly, 61% oppose and 31% support the holding of parliamentary elections only even if they are to take place in both the West Bank and the Gaza Strip. 54% say they will not participate in West Bank-Gaza Strip elections if they were restricted to a parliamentary vote and 41% say they will participate in such elections. Willingness to participate in the elections, if restricted to the PLC but were held in both the West Bank and the Gaza Strip, is higher among those whose age is 50 years of higher (44%) compared to those whose age is between 18 and 22 years (37%), among men (47%) compared to women (35%), among residents of villages/towns (46%) compared to cities (40%), among holders of BA degree (41%) compared to those who finished elementary school (33%), among the religious (45%) compared to the somewhat religious and the non-religious (39% and 35% respectively), and among supporters of Fatah and supporters of Hamas (61% and 51% respectively) compared to supporters of third parties (41%). Similarly, 62% say they will not participate in elections if they were parliamentary only and if they were to take place in the West Bank only; 29% say they will participate in such elections. Willingness among West Bankers to participate in the elections, if restricted to the PLC and were held in the West Bank only, is higher among men (30%) compared to women (27%), in refugee camps and villages/towns (38% and 36% respectively) compared to cities (25%), among those whose age is 50 years or higher (32%) compared to those whose age is between 18 and 22 years (24%), among the religious (32%) compared to the somewhat religious and the non-religious (28% and 18% respectively), among supporters of Fatah (50%) compared to supporters of Hamas and third parties (29% and 24% respectively). 64% are worried and 34% are not worried that domestic conditions would deteriorate in case the position of the president become vacant. But 47% believe that when the position of the president is vacant, Palestinian factions will be able to reach an agreement on conducting presidential elections in the West Bank and the Gaza Strip in order to elect a successor; 45% believe that the factions will not reach such an agreement. Despite this, 60% of the public want president Abbas to resign while 35% want him to remain in office. Three months ago, 64% said they want Abbas to resign. Demand for Abbas’ resignation stands at 55% in the West Bank and 68% in the Gaza Strip. 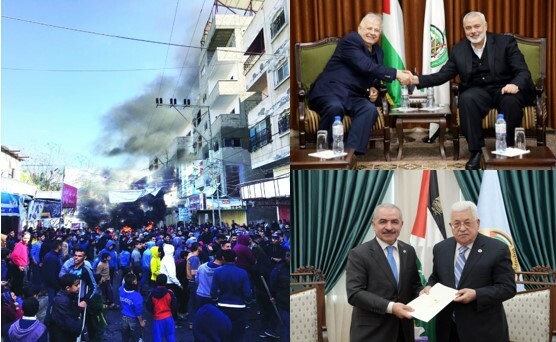 Three months ago, demand for Abbas resignation stood at 55% in the West Bank and 77% in the Gaza Strip. Level of satisfaction with the performance of president Abbas stands at 34% and dissatisfaction at 62%. Level of satisfaction with Abbas stands at 40% in the West Bank and 24% in the Gaza Strip. Three months ago, satisfaction with Abbas stood at 32% (38% in the West Bank and 23% in the Gaza Strip). If new presidential elections were held today and only two were nominated, Mahmoud Abbas and Ismail Haniyeh, the former would receive 51% and the latter 41% of the vote (compared to 42% for Abbas and 49% for Haniyeh three months ago). In the Gaza Strip, Abbas receives 47% of the vote (compared to 36% three months ago) and Haniyeh receives 51% (compared to 62% three months ago). In the West Bank, Abbas receives 55% (compared to 46% three months ago) and Haniyeh 33% (compared to 41% three months ago). If the competition was between Marwan Barghouti and Ismail Haniyeh, Barghouti receives 64% and Haniyeh 33%. If president Abbas does not nominate himself in a new election, 35% prefer to see Marwan Barghouti replacing him, while 19% prefer Ismail Haniyeh. Mohammad Dahlan is preferred by 7% (2% in the West Bank and 16% in the Gaza Strip). Rami al Hamdallah is selected by 4%; Khalid Mishal, Saeb Erikat, and Mustafa Barghouti by 3% each, and Salam Fayyad by 2%. A majority of 54% view and 42% do not view the PLO as the sole legitimate representative of the Palestinian people. It is worth noting that the belief that the PLO is the sole legitimate representative of the Palestinian people stood at 58% nine months ago and at 69% thirteen years ago. The belief that the PLO is the sole legitimate representative of the Palestinian people is higher in the West Bank (56%) compared to the Gaza Strip (51%), among residents of villages/towns (60%) compared residents of cities and refugee camps (55% and 42% respectively), among non-refugees (58%) compared to refugees (49%), among those whose age is 50 years or higher (58%) compared to those whose age is between 18 and 22 years (50%), among the illiterates (67%) compared to those who hold a BA degree (58%), among those who work in the public sector (58%) compared to those who work in the private sector (53%), among the married (56%) compared o the unmarried (49%), among the somewhat religious (57%) compared to the religious (51%), among the supporters of the peace process (66%) compared to those who oppose the peace process (33%), and among supporters of Fatah (85%) compared to supporters of Hamas and third parties (30% and 49% respectively). 38% are satisfied and 40% are dissatisfied with the selection of Mohammad Shtayyeh as the next prime minister. In the Gaza Strip, dissatisfaction reaches 52%. The largest percentage (48%) believes that a government led by Shtayyeh will not succeed in achieving reconciliation and unifying the West Bank and the Gaza Strip while 35% believe it will succeed. Similarly, the largest percentage (44%) believes that a government led by Shtayyeh will not be able to organize legislative and presidential elections in the West Bank and the Gaza Strip while 40% think it will succeed. Half of the public believes that a Shtayyeh government will not be able to improve economic conditions in the PA while 36% believe it will be able to do that. Satisfaction with the selection of Shtayyeh is higher in the West Bank (41%) compared to the Gaza Strip (34%), among men (41%) compared to women (36%), in villages/towns (44%) compared to cities and refugee camps (37% and 36% respectively), among non-refugees (41%) compared to refugees (34%), among those whose age is 50 or above (40%) compared to those whose age is between 18 and 22 years (33%), among those who work in the public sector (49%) compared to those who work in the private sector (38%), among the somewhat religious (40%) compared to the religious and the non-religious (36% and 35% respectively), among supporters of the peace process (46%) compared to those who oppose the peace process (24%), and among supporters of Fatah (65%) compared to supporters of Hamas and third parties (18% and 34% respectively). Now after Israel deducted part of the custom revenues it transfers to the PA and after the PA has refused to accept the incomplete transfer, an overwhelming majority (69%) is worried and 25% are not worried that the PA will not be able to pay salaries to its public sector. Moreover 54% are worried and 40% are not worried that the PA’s inability to pay salaries to its public sector will lead to PA collapse. The percentage of those who are worried is higher in the Gaza Strip (58%) compared to the West Bank (51%), among women (57%) compared to men (50%), in refugee camps and cities (55% and 54% respectively) compared to villages/towns (49%), among non-refugees (55%) compared to refugees (51%), among the illiterates (68%) compared to holders of BA degree (51%), among housewives and laborers (60% and 57% respectively) compared to professionals and students (39% and 48% respectively), and among supporters of third parties and supporters of Fatah (61% and 55% respectively) compared to supporters of Hamas (47%). Positive evaluation of conditions in the Gaza Strip stands at 4% and positive evaluation of conditions in the West Bank stands at 20%. In a close-ended question, we asked respondents to identify the party or side responsible for the worsening conditions in the Gaza Strip: Israel, Hamas, the PA and Abbas, Egypt, or others. The largest percentage (37%) blames Israel while 25% blame Abbas and the PA, 21% blame Hamas, 4% blame Egypt, and 9% blame others. Responses of West Bankers differ from those of Gazans: 41% of Gazans, compared to 16% of West Bankers, blame Abbas and the PA and 27% of Gazans, compared to 17% of West Bankers, blame Hamas. Perception of safety and security in the Gaza Strip stands at 64%. In the West Bank perception of safety and security stands at 57%. Three months ago, perception of safety and security in the Gaza Strip stood at 55% and in the West Bank at 47%. Despite that, 29% of the public say they want to emigrate due to political, security, and economic conditions. The percentage rises in the Gaza Strip to 43% and declines in the West Bank to 20%. Only 32% of the West Bankers say that people can criticize the authority in their area without fear and 65% say that they cannot. In the Gaza Strip, 41% say that people can criticize the authority in their area without fear and 53% believe that they cannot. Perception of corruption in PA institutions stands at 82%. The public is divided over the assessment of the PA: 47% view it as a burden on the Palestinian people while 47% view it as an asset for the Palestinian people. The belief that the PA is an asset is higher in the West Bank (51%) compared to the Gaza Strip (41%), in cities and villages/towns (49% each) compared to refugee camps (37%), among those whose age is 50 years or higher (49%) compared to those whose age is between 18 and 22 years (43%), among laborers, housewives, and employees (53%, 49%, and 45% respectively) compared to students and professionals (38% and 41% respectively), among those who are married (49%) compared to the unmarried (42%), among the somewhat religious (50%) compared to the religious (43%) among supporters of the peace process (61%) compared to those who are opposed to the peace process (23%), and among supporters of Fatah (84%) compared to supporters of Hamas and third parties (21% and 42% respectively). 30% are optimistic and 67% are pessimistic about the success of reconciliation. Three months ago, optimism stood at 29%. The public is opposed to Abbas’ position that Hamas must fully hand over control over the Gaza Strip to the reconciliation government, including the ministries, the security sector, and the “arms:” only 38% agrees with Abbas’ demand but a majority of 58% disagrees. Three months ago, 34% said they agreed with Abbas. When the question of “arms” was further clarified by asking the public if it supports or opposes the continued existence of armed factional battalions in the Gaza Strip alongside the official PA security sector forces, 71% said that they prefer to keep the armed battalions in place and only 24% said that they oppose the continued existence of the armed battalions in the Gaza Strip. It is worth noting that on this matter, there are no major differences between the attitudes of the West Bankers and Gazans. Moreover, an overwhelming majority (82%) demands that the PA immediately lift all the measures taken against the Gaza Strip, such as public sector’s salary deductions and the reduction in access to electricity; only 14% say that such measures should be removed only after Hamas fully hands over control over the Strip to the reconciliation government. Support for the concept of the two-state solution stands at 48% and opposition at 50%. No description or details were provided for the concept. Three months ago, support for the concept stood at 43%. Yet, when we asked the public to choose between the two-state solution, the one-state solution, or any other third solution, 49% said they prefer the two-state solution, 17% said they prefer the one-state solution, and 23% preferred some other solution. It should be noted however that in this question we have defined the two-state solution to mean “a Palestinian state alongside Israel based on the 1967 borders and East Jerusalem as its capital.” The one-state solution was defined as “a state that includes Israel, the West Bank and the Gaza Strip in which Palestinians and Israeli Jews enjoy equal rights in all matters.” Three months ago, support for the two-state solution stood at 45%, for the one state solution at 22%, and 23% preferred a third undefined alternative. The preference for the one-state solution over the others is higher in the West Bank (21%) compared to the Gaza Strip (12%), among non-refugees (20%) compared to refugees (13%), among the illiterates (29%) compared to holders of BA degree (13%), among the non-religious and the somewhat religious (27% and 20% respectively) compared to the religious (12%), among supporters of the peace process (21%) compared to those who are opposed to the peace process (13%), and among Fatah supporters (19%) compared to supporters of Hamas and third parties (9% and 14% respectively). A majority of 58% believes that the two-state solution is no longer practical or feasible due to the expansion of Israeli settlements while 37% believe that the solution remains practical. Moreover, 77% believe that the chances for the creation of a Palestinian state alongside the state of Israel in the next five years are slim or nonexistence while 21% believe the chances to be medium or high. The most preferred way out of the current status quo is “reaching a peace agreement with Israel” according to 39% of the public while 30% prefer waging “an armed struggle against the Israeli occupation.” Only 11% prefer “waging a non-violent resistance” and a minority of 17% prefers to keep the status quo. Three months ago, 34% said that they prefer reaching a peace agreement with Israel and 34% said they prefer waging an armed struggle. Support for waging an armed struggle is higher in the Gaza Strip (38%) compared to the West Bank (25%), among residents of refugee camps (40%) compared to residents of cities and villages/towns (30% and 25% respectively), among refugees (33%) compared to non-refugees (28%), among those whose age is between 18 and 22 years (38%) compared to those whose age is 50 years or higher (26%), among those who hold a BA degree (29%) compared to the illiterates (13%), among students (46%) compared to farmers, housewives, laborers, and employees (8%, 26%, 31% and 31% respectively), among the non-married (37%) compared to the married (28%), among the religious (34%) compared to the somewhat religious (27%), among those who are opposed to the peace process (51%) compared to supporters of the peace process (19%), and among supporters of Hamas (52%) compared to supporters of Fatah and third parties (18% and 23%). The public is divided over the role of negotiations and armed struggle in the establishment of a Palestinian state next to the state of Israel: 37% think that negotiation is the most effective means while 36% think armed struggle is the most effective means, while 22% believe that non-violent resistance is the most effective. Three months ago, 28% said negotiation is the most effective means and 44% said armed struggle is the most effective means. In light of the suspension of peace negotiations, Palestinians support various alternative directions: 55% support popular non-violent resistance; 47% support a return to an armed intifada; 41% support dissolving the PA; and 31% support abandoning the two-state solution and demanding the establishment of one state for Palestinians and Israelis. Three months ago, 54% said they prefer a return to armed intifada and 47% said they prefer to dissolve the PA.
65% support and 31% oppose the PLO Central Council’s decision to stop security coordination with Israel. But 78% believe that the PA leadership and security services will not stop security coordination with Israel. More than three quarters (76%) believe that if Israel ban Muslim prayer at al Rahma Gate (Gate of Mercy) area, Palestinian protests will succeed, as the case was with the metal detector gates, in forcing Israel to allow such prayer; 21% believe Palestinian protests will not succeed this time. A majority 64% believe that visits of Israeli officials to Arab countries damage the chances for resolving the Palestinian-Israeli conflict; 8% believe the visits help to promote peace and 26% believe they neither help nor hurt conflict resolution. An overwhelming majority (83%) believes that the Trump Administration is not serious about launching a new peace plan and 12% believe it is serious. We asked the public about its expectations from the plan, if and when it is submitted to the parties. A large majority of 79% believes that if the US does indeed offer a peace plan, it will not call for the establishment of a Palestinian state next to the state of Israel; 15% believe it will. A similar percentage (81%) believes that the plan will not call for a Palestinian capital in East Jerusalem; 14% believe it will. 78% believe the Trump plan will not call for the borders of the Palestinian state to be based on the lines of June 1967 with minor mutual land swaps; 17% believe it will. An overwhelming majority of 84% believes the plan will not call for a just solution to the refugee problem; 10% believe it will. Similarly, 84% believe the plan will not call for the ending of the Israeli occupation and the withdrawal of the Israeli army from the areas occupied in 1967; 11% believe it will. For all of the above, 79% believe that the Palestinian leadership should reject the US plan, if offered, and 14% believe it should accept it. But if the Trump plan does indeed include all such items, such as a Palestinian state with East Jerusalem as its capital, with borders based on the 1967 lines, a just solution to the refugees’ problem, and an Israeli army withdrawal from the territories occupied in 1967, a majority of 52% calls for rejecting it and 43% call for accepting it. Call for accepting the plan is higher in the Gaza Strip, standing at 55% while the call for rejecting it is higher in the West Bank, standing at 59%. Support for accepting the American plan if it contains all these Palestinian needs is also higher among men (46%) compared to women (40%), in refugee camps (48%) compared to villages/towns and cities (41% and 43% respectively), among refugees (47%) compared to non-refugees (41%), among holders of PA degree (49%) compared to the illiterates (35%), among those who work in the public sector (55%) compared to those who work in the private sector (41%), among supporters of the peace process (50%) compared to those who are opposed to the peace process (33%), and among supporters of Fatah and third parties (54% and 49% respectively) compared to supporters of Hamas (34%). A majority of 64% is opposed and 23% is not opposed to a resumption of dialogue between the Palestinian leadership and the Trump Administration. Official contacts between the PA and the US government were suspended by the PA after the US recognized Jerusalem as the capital of Israel. Opposition to the resumption of dialogue with the US is higher in the West Bank (70%) compared to the Gaza Strip (54%), in villages/towns (71%) compared to cities and refugee camps (64% and 57% respectively), among non-refugees (66%) compared to refugees (62%), among those who are opposed to the peace process (75%) compared to supporters of the peace process (61%), and among supporters of Hamas and third parties (69% and 68% respectively) compared to supporters of Fatah (59%).